Winter is here. Now what? 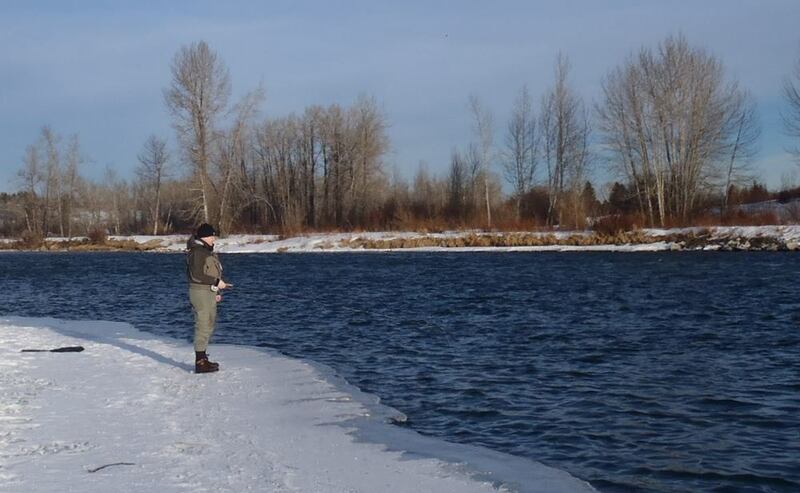 Right now, in our neck of the woods, winter is officially upon us and the fly fishing season is pretty much over. Sure we can head south to the big tail water to fish in the winter or maybe visit a nearby spring creek on a sunny winter day, but realistically, the season is done. It’s a sad time for all of us fly fishers in the northern half of the world when we must accept the fate of where we live and fish. But before you put away rods and reels in favor of vises and bobbins, there are some small chores to do. Proper maintenance of your basic gear is crucial to ensuring it will last and perform when you need it come spring time. It’s always a good idea to take apart your rods and give them a wipe down before storing them in the off season. A damp soft cloth is more than enough of a treatment. For an extra finish, you can take a cotton swab and do a quick cleaning on the inside of the rod guides. Grit and particles can sometimes build up there and slowly wear down your fly line. Ensure that the rod is fully dry before storing in its rod sock or tube and lay it down on its side to prevent any stress on the sections. It’s best to keep rods indoor somewhere warm rather than in a cold garage. Reels need much maintenance but shouldn’t be completely ignored. Take the spool out of the reel and wipe the inside with a soft cloth. Dirt and grit will most definitely be clinging to the lubricant on the spool post. Clear this away with a soft cloth or a cotton swab for those smaller areas. The inside part of the spool where the reel post inserts will also hold some soiled lubricant. Clean this away as well. Apply a small amount of fresh lubricant to the reel post before replacing the spool. It’s also important not to leave your reel in storage all winter with the drag tightened up. Loosen it off when the season is done. By far, fly lines require the most maintenance of all your gear. There are several factors that can break down fly line over the winter. Lines can become coated in grit and pollutants as well as break down due to UV light exposure. Cleaning and treating your lines will greatly increase their longevity and performance. It’s a good idea to fully strip the lines from your reels and give them a good wipe down with a soft cloth that has been lightly coated with a line cleaner/conditioner such as Superfly’s SuperSlick. Just dab a drop or two on the cloth and slightly rub it into the cloth with your fingers. Fold the treated part of the cloth around the fly line and run the line through it. This will lightly coat the line and give it great protection as well as help to increase distance when casting. In addition to the cleaning treatment it is also a good idea to remove your lines from the spools for storage. This will reduce the amount of spool “memory” your line will have and help keep it straight. Strip the line from the reel and wrap through your hand and around your elbow, the same way you would wrap an extension cord. Don’t wind it too tight. Gently wrap a twist tie or piece of string around the middle of the line and label it so you know which line is which. Lines can be stored this way in a drawer or shelf somewhere cool and dark. Once lines have been taken off the spool it’s a good time to inspect the backing. Chances are it’s been there for a while and maybe needs replacing. Backing, because it’s usually a braided line, collects a lot of grit that gets trapped within its loops and since it holds moisture more than fly line, it sometimes can develop mildew. Best to take this off and replace it every few seasons. There. Done! Your clean-up for the season is finished and now you can get back to the fly tying bench. It may be many cold months before you’ll see the rods and reels again, but they will be in “ready-to-go” shape as soon as Mother Nature makes it possible to get out on the water again. Have we missed anyone? Let us know of a club not on the list. © 2019 Superfly International Inc.